Izuskan scarfs are made of the best quality cotton. Our sari scarf has a 100 % Modal sari on top of our original Izuskan scarf . 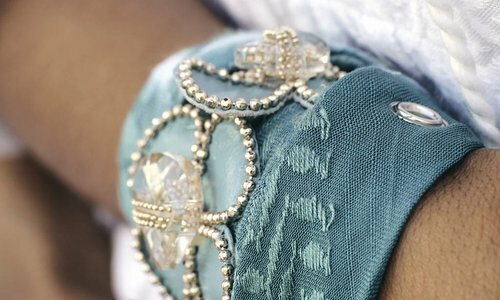 This scarf is abundantly decorated with exclusive trimmings and a silver pearls application. All Izuskan scarfs have unique colors and designs! Each piece has its owns story and finally belong to somebody. Beautiful gentle scarf made of 100% high quality cotton. All in unique colors and designs. Our small scarf is a size 85 x 85 cm. Buy the one you love!